I continued my long tradition of NHL hockey 'guys trips' this month with a journey down to sunny Tampa, Florida with five buddies. Previous to this trip we had seen live NHL hockey in Pittsburgh, Columbus, Nashville, Phoenix and New Jersey, so it was nice to be able to combo up the hockey with a side of lovely Florida Gulf Coast beach action. After an uneventful but ungodly early travel morning we arrived in Tampa. 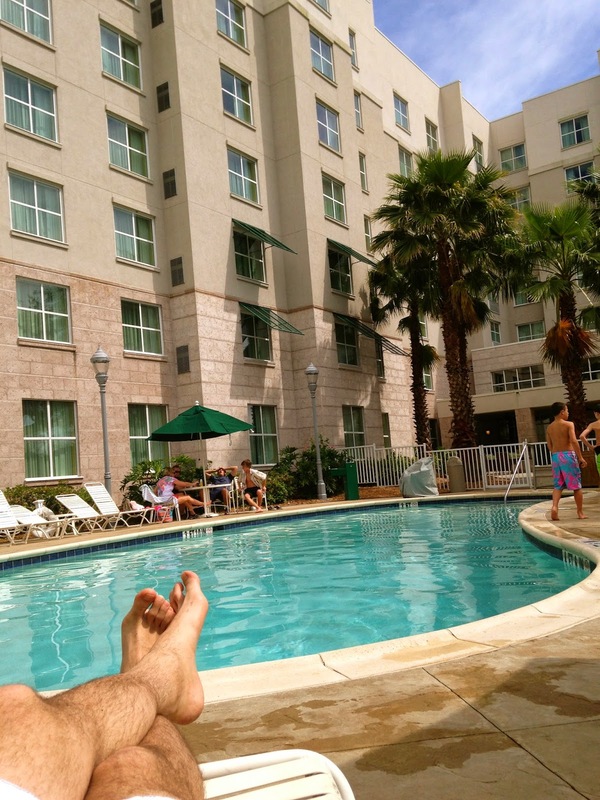 Things started positively with some welcomed sunshine and a quick check-in to the Homewood Suites Tampa Westshore. We chose the airport location as it was sort of central between the beaches to the west and the core of the city to the east, and we had a van rented for easy transportation. I had stayed at this hotel previously, and typically always go for a Homewood when in the US, as their vast array of amenities and perks can't be beat. After the eternal winter we have been experiencing here in southern Ontario, the boys opted for a trip down to the outdoor pool to catch a few rays prior to our first of two Tampa Bay Lightning games that evening. We loaded our coffee cups up with "coffee" and kicked off the party pool-side. After a bit of swimming and tanning (well, burning) we headed down to Ybor City, a historic district of the city originally known for early Spanish, Cuban and Italian immigrants and cigar manufacturing in the late 1800's, recently revitalized into a vibrant nightlife hub. Our first good eats of the trip came at Tampa Bay Brewing Company. A cool brew-pub whose delicious apple cider wings were featured on Food Network's Diners Drive-ins & Dives. The wings were outstanding, but the reviews from the group were mixed on the craft beer offerings. Although there seemed to be no shortage of action going on in Ybor that night, we couldn't stick around for long as we had to run to the hockey game. Getting pumped up for some wings @ Tampa Bay Brewing Co.
As is the case with many US-based NHL teams, we were able to grab scalped tickets to the game for below face value. As the marquee game featuring our hometown Toronto Maple Leafs wasn't until a few days later we decided to just grab upper bowl seats for the unheard-of (in Toronto anyways) price of $15. This worked out well as by the 2nd period we were able to migrate down to some unoccupied lower bowl seats to enjoy the rest of the game. The Lightning were smoked by the visitors from Dallas, but our discovery of the in-stadium Bud Light Party Deck with $2 draught beers after the game and a great view of the downtown ended up being the highlight of the night. Afterwards the majority of us decided to head back to the hotel as we were running on fumes after our 4AM wakeup call that morning. We finished the night with a brief musical session around the hotel fire pit with a few others who were winding down. The next day we set out to Clearwater Beach, the closest and most popular of the Tampa-area Gulf beaches. Being the weekend and a beautiful day, the beach was apparently a quite popular idea. Traffic was horrendous coming in from Tampa and parking was relegated to the 7th floor of a hotel parking structure. 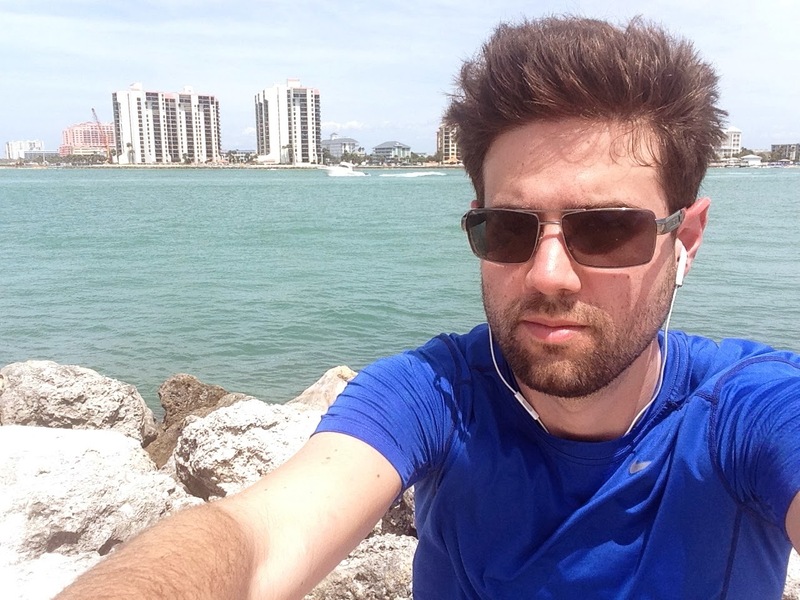 Wanting to keep some semblance of a workout regime while away, I went for an 8KM run down the main strip and across a large bridge to a neighbouring island and Sand Key Park. I eventually hoofed it back to the beach for my first taste of the ocean and to try and even out my tan. The crystal clear water and fine white sand of the Florida Gulf Coast simply can't be beat outside of the Caribbean for any beach lover. Although Clearwater Beach was beyond busy, the strip is so massive that we had no issue securing our own piece of real estate for the afternoon. That evening we returned to Tampa and decided to stay close to our hotel. I recommended the nearby classic American institution The Cheesecake Factory for dinner, and the crew was not disappointed. Afterwards we kicked around the International Plaza area for a few drinks. This is a cool little modern entertainment district with a bunch of restaurants and bars inter-connected by a cobbled courtyard. However, being a Sunday everything was closing up earlier than expected. We tried to get into the one place that was still hopping called Blue Martini but apparently the bouncer wasn't impressed with our shorts (it's Florida man!). We were able to grab a hotel shuttle bus from an affiliate hotel who said he could take us to another bar not too far away (The Brickhouse), which also ended up closing shortly thereafter. At this point we had to decide whether to grab a pricy cab downtown or accept defeat and head back to the hotel. We chose the latter and finished the night with beers and the horrible film 2012.